Join us! NCFM is proud to be a sponsor of the this first ever event. Make sure there is a Fathers' Day event lik this in your community too! Get busy! Celebrate Dads! The National Coalition For Men will be participating in the first ever Fathers’ Day Walk-a-thon in San Diego. The event is a kick off for the newly formed San Diego Children Coalition. We will have a booth and if things go right, there will be a large National Coalition For Men banner at the start/finish line. NCFM is a founder of the San Diego Children Coalition and we are honored to be involved in this first ever celebration of Fathers. I am hoping that anyone in the area on this list will help and participate. If you would like to do either please email me as soon as possible. If you are a business owner, you might consider having a booth at the event. We need walkers! Hundreds and hundreds of walkers! Since this is the first year of this event, we need people to join us. We need to make this successful so we can stage it year after year. Bring your Dad! Have some fun! Join help and us, bring everyone you know and have fun. It is a day for Dads and we are celebrating it the day before Fathers’ Day so Dad still has one day to do whatever he wants! This is a historic event. You do not want to miss being a part of it. Join us. Specific even information is below. Please come join us Saturday, June 18th from 8:00am to 5pm as the San Diego Children’s Coalition celebrates Father’s Day with a Festival & Walk-A-Thon to remember and thank our fathers on Father’s Day weekend! There are many great dads who are either struggling as single parents or away serving in the military. Our Fathers should always be in our hearts! Please come walk for your father in the Father’s Day Walk-A-Thon along the picturesque Glorietta Bay to remember and thank your dad for all the great things he has done for you in your life and your family! The Father’s Day Walk will bring awareness of struggling fathers in need and benefit the newly launched San Diego Children’s Coalition and our charity partners participating in the Walk! Walk-A-Thon Entries: $35 – Family of 4 (Parents & Children and includes a free ticket to a drawing of children’s bikes donated by Wells Fargo!) and $20 – Adult entry! Two children’s bikes donated by Wells Fargo will be given away at at Festival! Bikes are fully assembled and include helmets. Tickets will also be used for opportunity drawings for gift certificates from our business partner for free dinners, spa packages, etc… You may purchase tickets at the Festival or in advance by making a donation on the Children’s Coalition website. If you are a charity organization and wish to participate as a partner in the Father’s Day Walk, please contact us at the San Diego Children’s Coalition at 619-806-9559 to find out more. The San Diego Children’s Coalition invites local business to participate in the Walk-A-Thon by becoming sponsors on our promotional materials, banners, and t-shirts. Please visit the San Diego Children’s Coalition website at www.SanDiegoChildren.org . 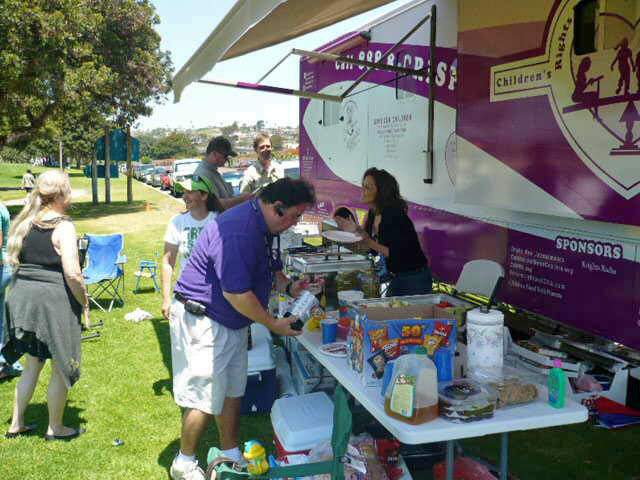 Looking forward to seeing you on Saturday, June 18th, a day before Father’s Day on Coronado Island! Viejas, Wells Fargo, T-Mobile, Bank of America, San Diego Padres, Union Tribune, Kearny Mesa Kiwanis Club, Brotherhood Lions Club, National Coalition for Men, Military Press, KPBS, Natural Awaking Magazine, John Harvard Academy, Men’s Legal Center, Honor Our Troops, Gold Coast Designs, Aero Patio, Life Source Water, Honest Tea, Renewal by Anderson, Newbridge College, FDIM, Fenstermen & Doors, eLiveLife, Forget Grass, Coronado Patch, Real Good Solar, Scentsy, Real Good Solar, Salad Masters, Therapy Dogs, Tera’s Treasures. Thank you NCFM, and all other parties involved in making this walk-a-thon a reality.